Feeling like your home is overrun with clutter? 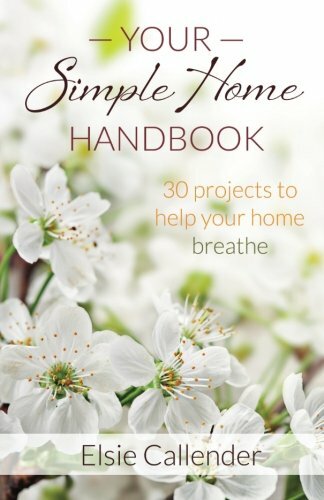 If you’re wishing you could simplify your home, Elsie Callender’s new book, “Your Simple Home Handbook: 30 Projects to Help Your Home Breathe,” can help! Elsie knows how to simplify – in the past year, she and her husband downsized to a 600-square-foot log cabin! She’s experienced what it’s like to have a home filled with stuff – and the long process to simplify. Through her book, Elsie walks you through the process room-by-room. Not sure of how you can simplify your kitchen? Five brief challenges can help you. With the help of 30 separate projects throughout your entire home, Elsie will guide you as you become more minimalistic. This book would be very helpful for homemakers who don’t know where to begin in their battle against clutter. If you’d like Elsie’s help as you create your own simple home, Your Simple Home Handbook sells for $7.95 as a PDF eBook and also as a paperback and Kindle book. Disclosure: Purchasing items through links in this post will result in a commission for Accidentally Green – at no added cost to you. Thank you for supporting this website!